Well guys, I have finished another sweater :) This time I managed to finish this in 3 weeks and 3 days - a personal record - and I didn't have to give up on the rest of my life while I made it, so that's a good sign :) I made this to participate in the Marion Knit Along with Andi Satterlund (the pattern designer herself). I've always loved this sweater as I saw others make it, so I decided this was a prime opportunity to try it out for myself at long last. 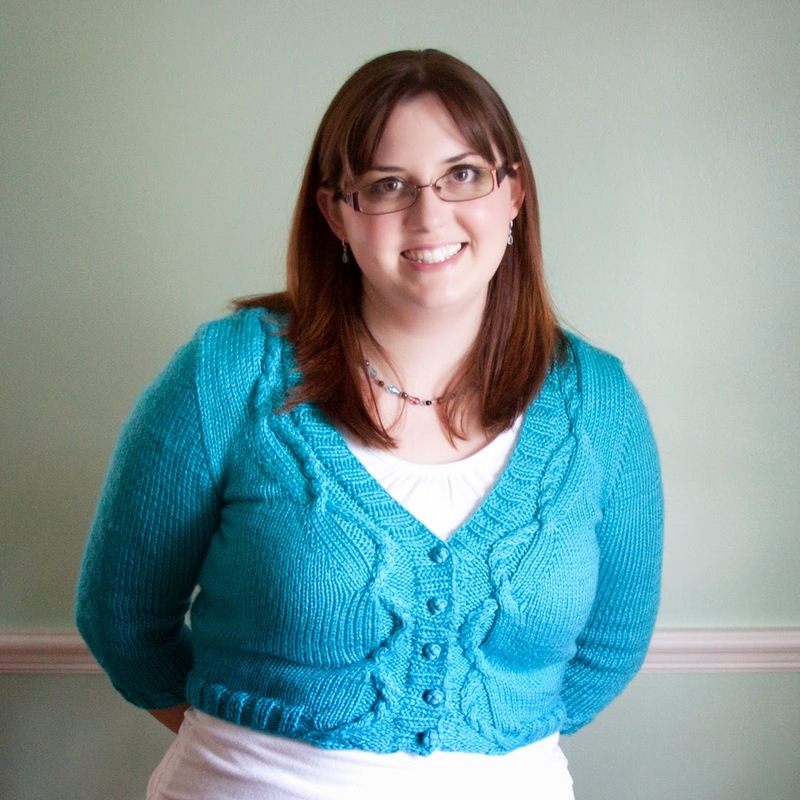 I'm going to lay it all out for those of you who haven't been along for the full ride :) I knew I wanted to make this sweater, but I also knew I needed to make it out of yarn in my stash since I'm on ultra-frugal-mode right now. I have a few wool yarns, but nothing that really spoke to me for this sweater, plus my last wool sweater was hot as the dickens (causing me to still not wear it - ugh, Florida). I do happen to have an obscene amount of Caron Simply Soft yarn though. Back when I first started knitting, Walmart was my "local yarn store" (so sad, I know), and when they put most of their yarn aisle on clearance I sprung into action ... leaving me with 11 (yes, ELEVEN!) skeins of this yarn in this colorway called Blue Mint. I had no idea what I would make with it at the time, but at $1.50 each that is still the best price I've ever gotten on this yarn so at least I did well money-wise. Anyway, now that I know much more about yarn and knitting (2 years later), this yarn just sits there taking up a ridiculous amount of space in my closet. I thought, "I wonder how this sweater will turn out in an acrylic yarn?" After a little research to make sure I wasn't setting myself up for disaster, I made the decision and off I went. Anyway, so my Marion is knit with the recommended needle size and this time around I decided to play with customizing the size a bit more for my body. This is my 3rd sweater from an Andi Satterlund pattern, so I felt confident about what I could expect fitting-wise. My adjustments were still quite basic: I knit the size L up til the waist decreases, then switched to the instructions for the size XL. I made the sleeves in size L and ended them 1 decrease set early because I like my sleeves to hit just below the elbow. When I had the knitting finished, I realized I had yet to pick out buttons for it. Oops. I shopped my stash and came across these fancy fabric knot buttons that my friend Tara gave me. To be honest, I never thought I would use these buttons in a million years. When I saw them in my stash, I was still skeptical. Could they match too well? I'm not usually one to go for matchy-matchy, but I just could not deny the hand of fate in this choice. These buttons are: the exact color as my yarn, the right size, have a texture that compliments the cables, and I only had 5 in my stash. I think in the end it was the fact that I had the exact number I needed for this project - no more weird knotted fabric buttons languishing in disuse. Hooray! One thing I did have to do differently was blocking this due to my yarn choice. You can't just wet block an acrylic yarn, you would be wasting your time. You have to block this stuff with steam. This was another dicotomized issue around the internet - some swore steam blocking would ruin your yarn, other said it was the best way to go. I decided to proceed with caution, keeping the actual iron at least 2 inches from the sweater to avoid scorching/melting. I pinned the sweater out to the size specifications first, then went over each section with the steam, making sure to blast steam directly at any places that needed extra effort. I paid particular attention to the cables and made sure to puff them up as I went. All worked out great :) I just left it pinned with a fan pointed at it until it was dry again and we were good to go! I will confess that my sleeve adjustment was a last minute decision. As I finished the 2nd to last decrease of the pattern, I decided to try the sweater on. Seeing that I liked where it was going to hit at that point, I just began the ribbing. 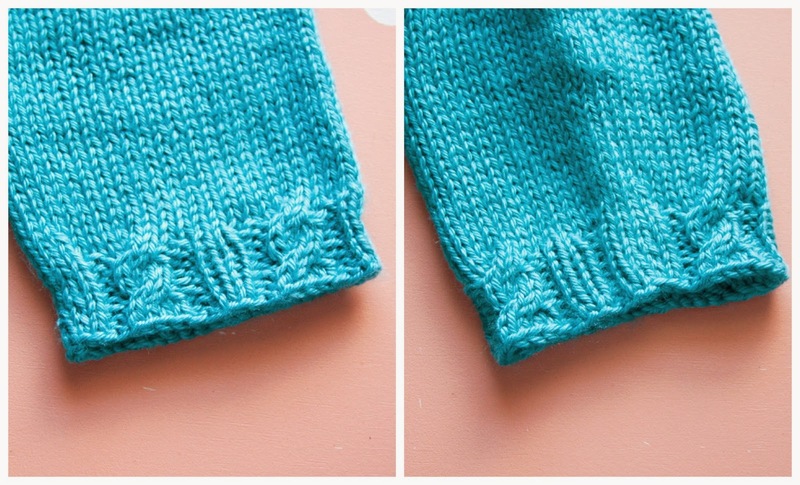 It was too late to figure out how to incorporate this change into the fancy cuff design, but I was able to just knit the extra stitches creating an additional rib piece. The extra knit section is along the underarm seam, so now one will ever know it's there unless I show them. I won't tell if you won't :) I do absolutely LOVE the little cables in the sleeve ribbing - probably more than is acceeptable, lol. I don't care though, I point out those cute little twists to anyone who will listen. All in all I had a lot of fun making this sweater :) The knit along was fun to read everyone else's design choices and see everyone's progress. I particularly enjoy reading about other people's fitting notes (I'm a knitting nerd, I know). I would definitely be tempted to join in another one of Andi's KALs (I really wish I had bit the bullet and worked on her Christmas Sweater KAL - such a good idea!). The day after I finished this sweater, we had a freak cool front here and the temp went into the mid 70s. This was just enough of a low for me to wear this and not die of heat stroke, so I wore it to work that day :) It was super comfy, not to hot, and got several compliments from random customers who had no idea I made it - that's a score in my book, lol. My only issue I had was that the shoulder seams came out a bit boxy. I've never had this happen with any of Andi's other designs, so I'm chalking it up to my yarn choice. One of these days I will try steam blocking the seams on a tailor's ham to try to push them down, but I just haven't felt like it yet. Other than that, I love this sweater :) So yay! Oh, for anyone who is curious, I name the the "Mindful Marion" because of all that happened while I was making it. I had some of the most stressful experiences of my life toward the end of this project, so I would just knit and think things over - knitting is great for that :) Things still aren't completely fixed, but they are much better and I know everything else will work out. Knitting is such a great activity for just thinking, you know? I'm glad I have this ability to help me through the ups and downs of life.